Early life stages of fishes have been shown to be especially susceptible to the toxic effects of heavy metal pollution. In this study, fathead minnow (Pimephales promelas) embryos were exposed in the laboratory to a graded series of aqueous methyl mercury concentrations under continuous-flow conditions. 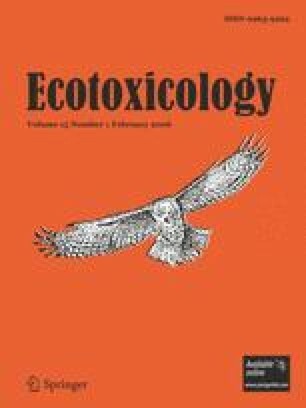 A number of toxicological endpoints were examined including; acute toxicity, bioaccumulation, protein production, impact on mitosis, gross and histopathology. Acute toxicity, reported as LC50 values of methyl mercury, ranged from 221 μg/l (95% C.I. 246–196 μg/l) for 24-h tests to 39 μg/l (95% C.I. 54–24 μg/l) for 96-h exposures. Fathead minnow embryos were shown to rapidly take up mercury from the surrounding water. Mercury levels in embryos reached levels of 2.80 μg/g wet weight after 96 h exposure to 40 μg/l methyl mercury. An initial elevation of total protein in embryo was observed in embryos exposed to 25 μg/l methyl mercury during the first 12 h of development. At later stages, significantly lower levels of protein/μg embryo were observed. Methyl mercury had no effect on mitotic stages (p=0.05) in early, cleaving blastula-stage embryos. Live embryos and serial sections were utilized to characterize changes in embryo morphology and histopathology.